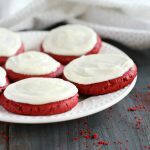 These Soft and Chewy Red Velvet Sugar Cookies are the perfect easy cookie recipe for Valentine's Day, Christmas, or any festive time of year. They're bright and colourful, gorgeous, delicious, and simple to make with only a few ingredients! Add the cake mix, flour, oil, sour cream, and eggs to a large bowl and mix on medium speed with an electric mixer until well combined. Roll the dough one tablespoon at a time (use a cookie scoop to ensure the cookies are all the same size) in your hands and place on a parchment lined baking sheet, flattening each ball with the flat bottom of a glass or measuring cup. Bake for 8 to 9 minutes (I bake for 8 and a half minutes) until the cookies just lose their shine. Cool on the baking tray for 5-10 minutes and transfer to a wire cooling rack to cool completely. Make the frosting by whipping the cream cheese and butter on high speed until light and fluffy. Add the powdered sugar and whip until the mixture is fluffy and spreadable. Frost the cooled cookies with the back of a small spoon or a small offset spatula and enjoy! For best results, enjoy these cookies the day they're made or store in an airtight container overnight and serve the next day. Freeze the cookies unfrosted if desired, and frost before serving. Freezing the cookies once they're frosted can cause the cookies to become soggy after you remove them from the freezer.